We believe that Nebraska students shouldn’t only visit the state capitol in fourth grade. 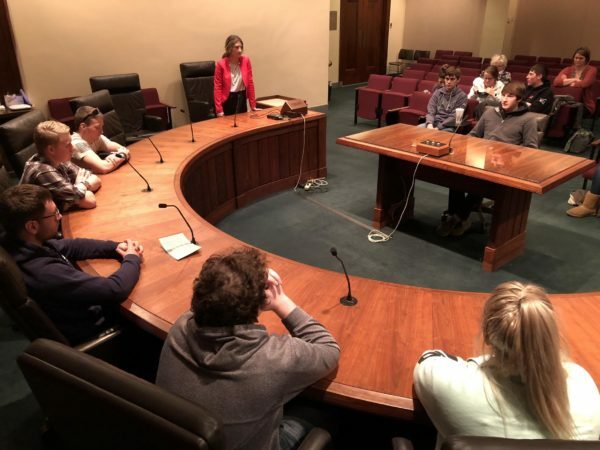 As one of Civic Nebraska’s flagship programs, Capitol Experience Days offer that opportunity to middle- and high-school students across the state. Capitol Experience Days go beyond a simple tour. They are designed to teach critical thinking, civil discourse, and the governing process through a speaker lineup of a state legislator, executive branch official (e.g. attorney general, lieutenant governor, etc.) and a Supreme Court justice. Students then engage in a mock committee hearing, in which they deliberate a piece of current legislation of their choice from different viewpoints. They research and discuss the bill as a senator, with supporting testimony, or with opposing testimony. By the end of the day, students have a thorough understanding of the Nebraska unicameral and their role as citizens in the state’s legislative process. Capitol Experience Days create civically engaged students who understand how to effectively advocate for their communities by honing civil discourse, critical thinking, and community leadership skills.